Runners in the Erbil Marathon. Join Untamed Borders and Free to Run in the Marathon of Erbil! It's a truly unique opportunity. The first 5 people who commit to raising a minimum of $5000 each for Free to Run will get a trip to Erbil, the capital of Iraqi Kurdistan, hosted by the adventure travel company Untamed Borders. The highlight of the trip will be the opportunity to meet Free to Run's first Iraqi team and run in the Marathon of Erbil. 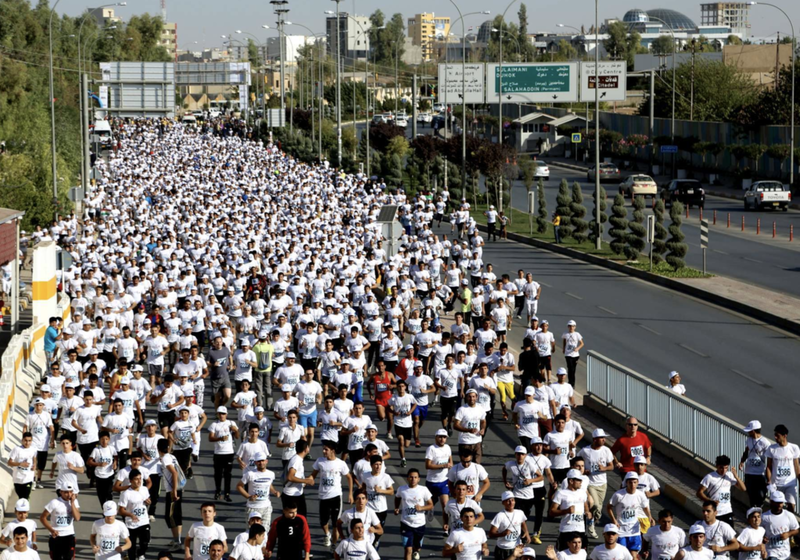 Since 2011, the Kurdistan Peace Marathon Organization has hosted a 5K, 10K and 42K race for both women and men. Organized by the Erbil Marathon Organization for Sport & Peace, this marathon has captured our attention because of their focus on, “using sport and running as a tool for spreading peace and non-violence in the community.” Several thousand runners will participate, and Untamed Borders will be there for this amazing race. Untamed Borders is an adventure travel company providing unparalleled access to some of the world’s most interesting and inaccessible places. They specialize in trips to Afghanistan, Pakistan, India, Middle East, East Africa, former Soviet Central Asia and the Caucasus. Photo Credit: Untamed Borders in Afghanistan. The team uses specialist local guides throughout, and their goal is to provide authentic and original experiences for their guests. Their groups are small which allows for greater security, flexibility, and access to local people and places. Each trip is individually designed to coincide with local events and in this case... it's the Marathon of Erbil! Day 1 – Arrive in Erbil. Briefing. Depending on time of arrival Untamed Borders will be able to arrange a city tour to some of Erbil's sights including the ancient citadel that dominates the center of the city. Day 2 – A day in the Kurdish countryside with some local runners. The day should be fun and hopefully will be able to get an insight into life as a runner in Iraq. Day 3 – A drive into the hills of Kurdistan to visit Lalish, the spiritual home of the Yazidi people. If there is time and the security situation allows you will also visit the Alqosh monastery high in the hills overlooking the Ninevah plains. Day 4 – For serious runners, this will be a day of rest. For others, the guides will discuss some options in or close to Erbil for some further sightseeing or meeting with organizations. 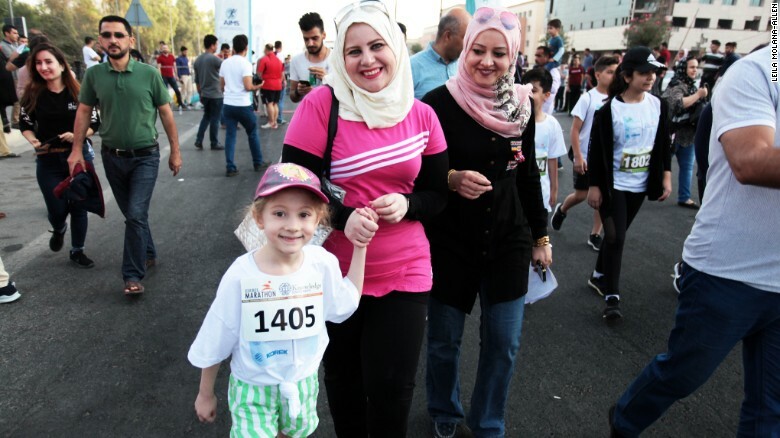 Day 5 – Run the Erbil Marathon. Our team will be there to get photos and support the runners before and after the race. Day 6 – We will drive back to Erbil to connect with afternoon or evening flights home. The marathon was started to create a healthy generation of athletes; encouraging and motivating young people, both male and female, to become runners. 83% of the participants are local runners, 27% are female and 18% are children. There are three distances (5km, 10km and full marathon) so even if you're not a strong runner you can take part and enjoy the event. The top 3 female runners in the 2017 Erbil 10K. To be considered for the trip, you must commit to fundraising a minimum of $5000 for Free to Run. Higher priority will be given to those who commit to fundraise above the minimum. We can provide fundraising support to help you surpass your goal, including helping you to set up your online fundraising page on Crowdrise or JustGiving. The trip from Untamed Borders will include accommodation, breakfast, ground transportation in Iraq, guiding, and entrance to the Erbil Marathon. The trip value is $1850. This trip does not include visas, insurance, flights to Iraq, entrance fees, lunches, dinners. If you have any trip-related questions, you’re welcome to contact Untamed Borders at info@untamedborderscom or +44 (0) 1304 262002. By supporting Free to Run’s mission of giving women and girls access to outdoor sports and leadership training, you’ll have the opportunity to see a side of Iraq that several of us know and love - and participate in a sporting event that’s creating a powerful and positive impact in the country. If you’re interested in fundraising for this incredible trip, please contact us at info@freetorun.org.